It’s all over the news, so I won’t go into the details. The heroes are the attorneys for the ACLU. So, I’m sending them a contribution right now. One Syrian women was reportedly about to be sent back to her home country when the ruling came down—and was promptly taken off the flight by Customs and Border Protection agents. The stay is temporary. There will be a court hearing to determine if the Executive Order is legal. The Judge ordered the government to turn over all names of people facing deportation under the Order. Will the Department comply with furnishing these documents? Trump has said a lot of times, he doesn’t like losing. It sure looked like he was going down in defeat in November. Every poll was against a Trump win. But, he proved them all wrong. There are two Donalds, the winning jubilant Donald and the losing Donald. The losing Donald can be angry, mean and yes dishonest. This is his history. Happy Donald and Dark Donald. Now, the latest salvo, is that 3 to 5 million Americans, who were here illegally voted and this is why he lost the popular vote. First, and most importantly, who cares? The rules are whoever wins the majority of the electoral vote wins the election. The election is a done deal. The news media are thinking this is just another dumb ego stroking bit of poop from the Donald. But, they (all of them, of course) are wrong. In the last few weeks before the elections, every single poll showed he was going to lose, so the Dark Donald was preparing for losing- and it wasn’t going to pretty. The 3 to 5 million stuff is poop, but it is left over poop from before the election. He keeps his left over poop. This is what the Dark Donald was going to throw if he lost. No graceful concession speech. He was going out like a fire ball. What did he have to lose? He was going to lump Obama and crooked Clinton into one, and that together say they stole the election. The American people were ripped off, because it was rigged. After losing and particularly if the election was close, Trump was going to tear into Obama, and say that in the months before the election, the INS was processing documents so illegal immigrants could vote. It takes 3 years after permanent residency status to get a green card. For those who had already passed their interview, and all that was left was administrative paperwork, INS was trying to speed up this processing, so they would not be swearing in a lot of new citizens just a few days after the elections. These are immigrants who had gone through the system, paid some pretty hefty fees to INS, and were qualified to vote. I suspect Trump had three speeches already on election night- the victory speech, the concession speech and the “this system is rigged” speech. So the 3 to 5 million illegal voters is just a bit of left over poop, which Trump just couldn’t resist using, even though he won. Problem of course he’s the President now and he just accused 3 million people of committing crimes and has the FBI at his disposal. During the campaign, the Affordable Care Act, or Obamacare, was viciously attacked by Donald Trump. He can’t repeal it without going through Congress. There is no replacement program. So what has he done with his January 20, 2017 Executive Order? Some will tell you he has reduced the economic burdens of the program on Americans. This nice sounding language is in the executive order. The ACA requires a lot of administration, because insurance plans must conform to certain coverage standards. What the Executive Order does, is to allow all agencies of government the ability to make Obamacare worse, by ignoring administrative responsibilities. Today’s headines in the NY Daily News, called the Executive Order will gut or dismantle Obamacare. It is designed to add a new layer of confusion to the administration of the program- just make it look worse than it is. Trumpcare doesn’t exist. What insurance companies need in order to grow, is to insure fewer people with health problems. This is why they want the ability to deny coverage or limit benefits to many people. The ACA was our country’s first real attempt to make these denials impossible. But, there had to be penalties for Americans who refused to either obtain private insurance or through the ACA exchanges because the system would not work if only people with health problems got insurance. He seems uninterested in toning down the rhetoric. Politifact.com has checked many of his claims and found 242 of them (60 % of them) to be mostly false, false , or pants on fire false. Pants on fire comes in at 19%. How do we get 90 million jobs back? 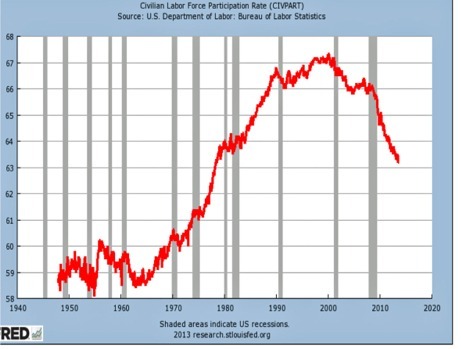 Labor Participation statistics were dropping during Bush Administration too- but Fox doesn’t mention this. Labor participation is more a measure of the aging of our population and does not correlate with unemployment and other common measures of our economy. If more young people are enroll in higher education, the Labor Participation go down. They don’t tell you this!. The author makes a real good point- the last thing we need is a return to 2008 and lower lending standards which encourages people to buy houses they can ill afford. This may not be shared with Donald Trump, as housing busts are terrific opportunities for people with cash to profit from foreclosures. Way too early to know Trump’s economic program includes relaxed lending regulations. My advice to anyone who is struggling to make car, credit card and student loan payments is to rent. For those who believe they have extra money, my advice if they are young to invest it in education. I try not to watch Fox News, as there are much better sources of solid news reporting. I only listened to part of Obama’s farewell address, then Sean Hannity came on, and started attacking Obama on economic policy. It was way over the top. In Part 1, three graphs, showing the Dow Jones Industrial Average, housing starts and unemployment show a very solid economic recovery trend from mid 2009 to 2016. But, the US economy has been changing. Workers with an assembly line job for a car manufacturer, could count on steady employment so long as the cars sold. Now, the big two challenges are whether the company wants to continue to manufacture the cars in the US and whether the job can be replaced by computer controlled robots. The above graph is from http://www.fivethirtyeight.com. Job growth in manufacturing has increased beginning in mid 2009, but there has been a down trend in manufacturing since about year 2000. So, Obama should be praised not blamed for help change the direction of the trend. The profits of manufacturers have not declined, except during the last year of the Bush term and manufacturing output has increased. So we make more with less workers. The culprit is automation. The housing ownership percentage was the highest around 2004 to 2006, during the housing bubble that finally burst in 2008. Does anybody still remember how people the ninjas (no income, no jobs) could get high interest loans and then these toxic assets were bundled with other debts to somehow qualify as safe investments? Finally, and least important is the labor participation graph. This shows over 24 year period, the percentage of the population working was increasing 5%, until it reach a maximum in 1997, and started to decline. The shaded bars represent recessions. During recessions, generally unemployment goes up, so why is labor participation going up during all recessions except the two? This downward trend is due in large part to the baby boomers retiring. Overall employment during Obama’s term increased steadily. I’ve seen a lot of booms and busts. You can see a bust in the shopping centers. New car lots are going out of business. Foreclosures everywhere. It didn’t happen on Obama’s watch. I’ve shown three common measures of the economy: stock market, unemployment and housing starts – all solid trends. I’ve shown manufacturing employment is down from levels 25 years ago. Profits are not. The last two statistic, home ownership and labor participation have to do with demographics which I don’t think Trump will change. Well, unless he wants to get the over 65 year old’s back on the assembly lines. Worst economic conditions since 1973. Labor participation has never been this low. Percent of home ownership now at a 10 year low. Deficits are sky rocketing. Thank God we got rid of Obama and his screwed up economic plan. Ok- this is from Fox news, Sean Hannity, right after Obama’s farewell address. I’ve embellished on a bit. This kind of bashing of the economy used to come from financial advisors with doomsday prediction, and then either “Buy my book … ” or “Call me now at 800- ….” so you will be protected. Now, it’s all about ratings. When things are bleak for large companies, the stock market crashes. The stock market crashed in 2008 at the end of Bush’s term as the banking/financial crisis got red hot. Now, the first big infusion of government money came during Bush’s term. Conservative Republicans hated this, and stated it was like throwing gasoline on a fire. But no recovery goes straight up. I count 9 dips in the Dow. As the economy recovered, unemployment dropped from 10% to 4.6%. And the housing market recovered as well beginning in late 2009. Unemployment and housing starts are two of the most closely watched barometers of the US economy. Average home prices have also increased, and bank requirements for new loans are more difficult than in the period of 2000 to 2008. This is why, the percentage of home ownership declined during Obama’s administration. Also labor participation declined as baby boomers retired. Increase enrollment in colleges may also be a factor. Has the election of Trump made a difference in the economy? Certainly, the stock market has rallied since November, but it is far too early to tell. I haven’t mentions the US debt and other important aspects of the economy. To be continued. I talked to someone about Trump, and he tells me we are in good hands. He listens to Fox News and plays golf 3 times a week. Not a bad life. There are some real tough questioning coming up on Trump’s cabinet positions. I guess the most troublesome is our future relations with China. We can not have a trade war with China, and expect their help in stopping North Korea’s nuclear plans. There was a great discussion on Fareed Zakaria show (GPS) with James Baker, saying that what previous republican presidents (Reagan & HW Bush) have favored was free trade agreements, and Trump’s new cabinet tends more towards protectionism. Baker said Trump as candidate, or now president-elect is not the same as when he actually moves into the White House with the staff making recommendations. Baker may be right. He’s not yet our president. However, the more Trump goes after Mexico stealing our jobs and their citizens pouring over the border, the more I worry that it’s the same old Trump, always playing politics with an incoherent foreign policy strategy. Putin wanted Trump over Clinton. It should have been Clinton’s greatest non-endorsement. Putin feels the breakup of the Soviet Union was a mistake, and some of the Baltic states should be part of Russia. Putin has expansionary ambitions. Sanctioning Russia for the hacking efforts was a tough call for Obama. It was an executive order, but this time Republicans did not fight him. Trump has the authority to reverse these orders- and I think he will. Trump’s response was weird at best, praising Putin for not responding in kind, with expulsion of US diplomats. Trump is very used to project management. In fact, he is a master at it. His team will come up with a 100 day plan, mainly dealing with domestic issues, including the repatriation of overseas funds. He has repeated attacked the NATO alliance and the UN. Now, he will need these organizations more than ever, and a lot of diplomacy to curb the ambitious Putin. With the transition underway, and resistance from Democrats on every level, I believe this will be the opportune time for Putin to make his move. I’m not certain where, but the western side of the Ukraine or one of the Baltic states would be obvious targets. The Trump test is coming. I wish he makes the right decisions as what happens in Europe affects everyone. Lesson to Trump – globalization is not a choice, it is a reality.